EgoSecure has two primary components, firstly the Insight Module collects information on the general network environment, discovering which storage devices were used over a defined period of time, what data was saved onto these devices or brought into the company, what data was stored in the cloud and which applications were actually used and the general data security situation of the network. The information is then displayed in graphs and very detailed tables. After the first run, management and administrators have a foundation of information so that protective measures are not set up blindly. Once the requirements of the protective measures are agreeed they are setup in the second module, IntellAct. 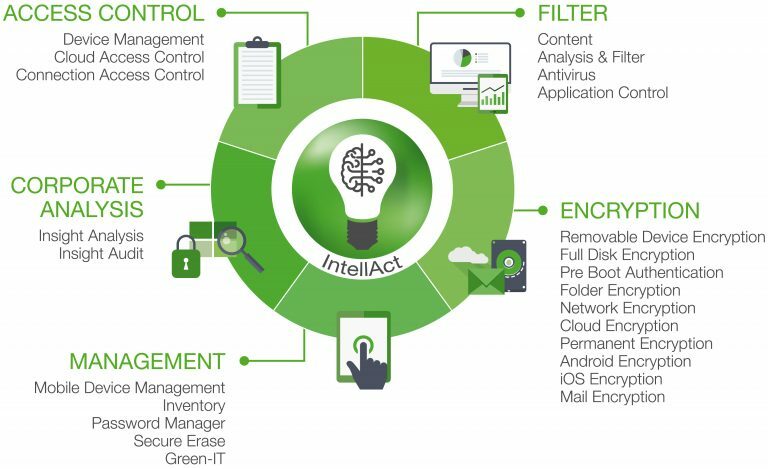 After configuration, the IntellAct module analyses the data from Insight and automatically activates protective measures based on the pre-defined rules previously configured. All functions are integrated into one solution controlled via a central management console.